I have the privilege of leading the Cru audit team of four auditors. They audit all of our ministry leaders yearly and ministry accounts every 3 years on a rotating basis. One of the auditors is Larry Kent; someone you might guess is an auditor. As I got to know him, I discovered his real passion — Sharing the gospel. Larry has developed a tract called, “Smiles.” It has been translated into over 100 languages. He gives it out freely from his website, http://www.on-tract.com , to anyone who wants to print it. It is my pleasure to inform you that the Lord is doing miracles over here through the tracts we’ve been giving out in Streets, Bus Park, Market & Schools. I was surprised yesterday when 32 students searched for me. They found me in the church compound & they said, as they were going through the tract on Sunday when they were in studies, that they felt something like a land breeze hovering around their gathering of over 80 students. So out of them 32 took an initiative of looking for me & I led them to salvation. Secondly brother, today in the evening have received a strange phone call from a man called Tobias. This man said, he has been a Muslim for 18 yrs since 1996 but when he read the tract which his son came home with, he got to know JESUS & I led them to salvation together with his family of 6 people over the phone. I will visit him soon. There are more & more testimonies that I cannot all explain brother. Vijay from Nepal wrote: I am very excited to knowing your ministry. Here I would like to share my interest to you that if it could be possible to print your tracts into Napali, it would be great. 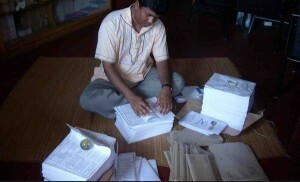 From Pastor Buckya in Banledesh: We are printing 60,000 of your tracts in 3 languages (Banjara, Teluga and Koya). They will change many people lives from darkness to holiness. Please pray for our team. We need strength, wisdom and good health to reach many unreached villages. What a privilege to work with someone like Larry! It reminds me how God wants to use us in our own unique ways. The world has gotten smaller with the web. While Satan may be using it for evil, people like Larry are using it to “let the whole world know.” Thank you for your prayers and support which allows me to work with someone like Larry.